While my son and I were on the subject of excavating fossils, it seemed it might be logical to jump from paleontology to archaeology. It didn’t hurt that, over winter break, JP’s teacher had emailed me about tracking down some good books about Ancient Egypt (see list at the end). And so, one snowy night, JP and I sat down on the couch to read the Treasure Trove that is The 5,000-Year-Puzzle-Old Puzzle: Solving a Mystery of Ancient Egypt (Ages 6-12), by Claudia Logan, illustrated by Melissa Sweet. An hour later, we were still reading it, my daughter and husband had joined us, and I almost couldn’t tear myself away to meet my girlfriends for a scheduled drink. Almost. I can’t think of a better introduction, not only to Ancient Egypt, but also to the painstaking role that archaeologists play in unearthing clues about ancient life. 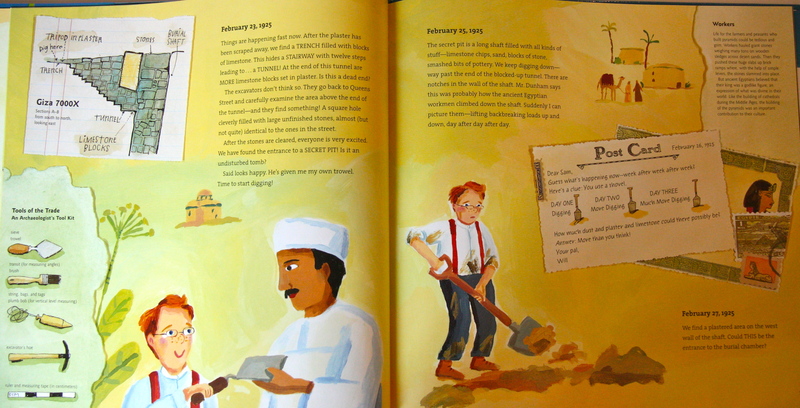 While the American boy and his father in the book are fictitious, they join an actual historic dig, led by a Harvard team of scientists, which occurred in 1924 at the Egyptian site of Giza 7000X, where a secret and unusually well-preserved tomb was discovered. Through a combination of actual historic records and the young boy’s first-person narrative, we learn about the team’s efforts to excavate this ancient site over the course of a year—including their continual revisions to hypotheses over whose tomb it was and why it was constructed in such a way. In the past, I’ve talked about how much I adore Melissa Sweet’s contributions to juvenile non-fiction, the way in which her unique collage style weaves historic and cultural artifacts into an accessible narrative. Here, she makes splendid use of a wealth of diverse texts provided by Logan. Dominating the story are the boy’s fictitious journal entries, which cover everything from his packing list, his seasickness on the boat to Africa, his initial impatience in waiting for the team to uncover something interesting—to his role in the discovery and identification of the buried sarcophagus. There are the postcards the boy writes to his BFF back home, with humorous cartoons and baseball analogies. There are the historic matter-of-fact sidebars, which provide fascinating background on topics like How the Egyptians Buried Their Dead, the Curse of the Pharaohs (which JP now makes reference to on a daily basis), and how our modern alphabet would translate to hieroglyphs. There are actual photographs of the team and their discoveries, including some of the finest examples to date of Egyptian furniture and jewelry. There are snippets of object registries (every piece of broken pottery had to be numbered and detailed), as well as newspaper headlines that ran about the dig back in the States. Finally, there are soft, often whimsical watercolors depicting the main events, lending just the right amount of awe and warmth to the claustrophobic underground chamber (complete with fleas) where the team spends much of its time, as well as to the funeral for one of the Egyptian team members who dies from pneumonia during the dig. The real magic here is the mystery—a mystery that begins with the owner of the tomb and grows even more complex when the archaeologists discover the unexpected absence of a mummy (although not of the body’s preserved organs—GROSS). Did someone steal the body of Queen Hetep-Heres? A theory is given, but we don’t know for sure. Like our narrator says in his last postcard before heading back home: “Archaeology takes time—no matter how much you want something to happen…We have one answer to the mystery of the secret tomb. But is it the whole story? Your soon to be seasick pal, Will.” Our children may not retain every detail, every discovery, in the book—but they will come away with an appreciation for the scientific process—something that might help them uncover mysteries of their own in the world. Love the correlation to the child’s present and future worlds. You are currently reading Digging for Mummies at What to Read to Your Kids.